We passed very early you and will return at 2:00 pm. approximately. The Tulum Express Half Day Tour from Playa del Carmen and the Riviera Maya is excellent for travelers who want more activities the same day, we take you to meet the unique archaeological zone located facing the Caribbean Sea, Tulum best known for her Wall, have the opportunity to walk in the Old Paths as did the Maya priests. We will visit El Castillo and the Temple of the Frescoes, buildings that stand out for their preservation and the high quality of the murals that still retain within them. 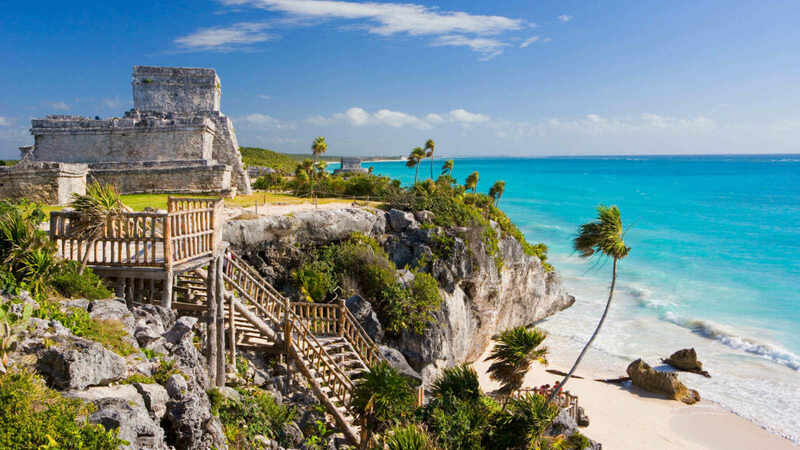 In the environment, in a protected area a huge number of houses built of wood and palm, of which little evidence is preserved today it was ¡La Aventura is in Tulum!. Pick Up from 7: 00-7: 30 am. Hotels in Playa del Carmen Riviera Maya, Playacar and (in some hotels access our vehicles is restricted by privacy issues customers a point near the hotel meeting shall appear). Return to their hotels, from 2:00-2:30pm. approximately. Ground Transportation Hotel - Tulum - Hotel.. Entrance to the archaeological site of Tulum. Certificate guide inside the archaeological site. $ 51.75 $ 45.00 Adults. $ 51.75 $ 45.00 Juniors 5 - 11 Years.